Barrix Catch Vegetable Fly Trap This product is a pest fly trap, which should be used with pheromones lure to attract and trap pests of the Bactrocera cucurbitae species of 226 sub species (commonly known as Melon Fly), which is a major pest of high risk which causes pre-harvest damages, and this pest cannot be controlled by any pesticide. 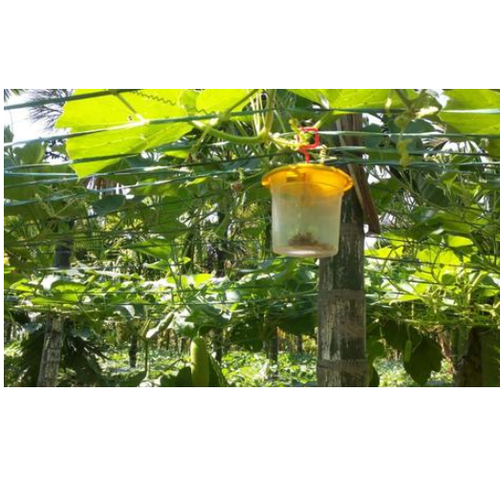 Container can hold 5400 Dead flies.We recommend farmers to use Barrix Catch Vegetable Fly trap along with Barrix Catch Vegetable Fly Lure while cultivating following crops:Fruits: Lemon, Orange, Jack Fruit, Passion fruit, Indian Almond, Kiwi fruits, Melons like Water Melon, Musk Melon, Pear Melon. Vegetables: Pumpkin, Cucumber, Chayote, Chillies, Capsicum, Tomato, Brinjal.Gourds like Bottle gourd, Ivy gourd, Bitter gourd, Snake gourd, Ash / White gourd, Gooseberry gourd (gherkins), Ribbed gourd, Sponge gourd, Peas like French Beans, Green Beans, Indian Peas, Pigeon peas.Commercial crops: Sun Flower, Maize. Since our inception in the market arena, Sumukha Farm Products Pvt. Ltd. have been consistent in carving a niche for ourselves in the trading, supplying and exporting domain of Premium Hybrid Seeds through our rigorous efforts and our unabated quality ethics policy. Our customer-base has always been in a consistent demand of our high-quality products. We have been trusted by our clients because each time we make a successful delivery to our customers, we are bound to receive a positive feedback. Our company, through the efforts of our teams, strives to provide full customer satisfaction with each product that we supply, and we have made this possible with the help of our expert team and professionals working at our units. We are engaged in offering various kind of Vegetables Seeds, Fruit Seeds, Tomato Seed, Mini, Cucumber Seed, Colored Capsicum Seed, Lettuce Seed, Melon Seed, etc. We are also engaged in offering fertilizers such as NPK Fertilizers, Calcium Nitrate, Potassium Nitrate, Potassium Sulphate Sop, Mono Ammonium Phosphate (MAP) 12-61-00, NPK Fertilizers 19:19:19, NPK Fertilizers 20:20:20, NPK Fertilizers 13:40:13, Magnesium Sulphate Heptahydrate and many more. We thoroughly understand the value of quality in these natural products, we have to look after their quality and nutritive states with utmost care, we can't let our hybrid seeds let lose their quality and provide our customers with in-qualified stuff. As a matter of fact, all the items that we supply are meticulously segregated and grown with care and precision. Our proficient quality analyzers take care of this meticulous process and make sure that the products supplied should represent the name of the company in the positive way.